A rainbow meme! 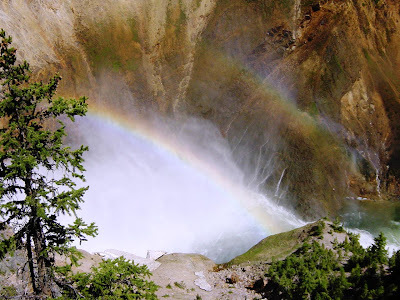 It's only fair to join in since you all were so willing to discuss trees and all, so here are a few of my favorite rainbows, although two of them are more properly fallbows. It is kind of fun to go searching through all those photos that got taken in between geology shots. The first was taken in the Sierra foothills at the beginning of a Yosemite trip. 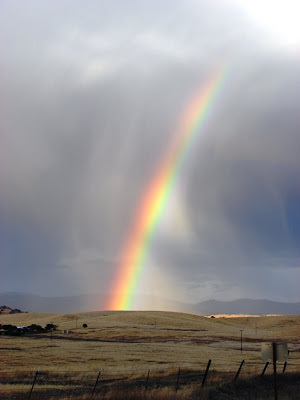 It was spectacular, but it also meant there was a storm, and warm as it was in the San Joaquin Valley that day, by the time we got to camp at 5,500 feet, we were in rain about 300-400 feet below the snow line...it was cold and wet! The third is at the base of Vernal Falls in Yosemite National Park. 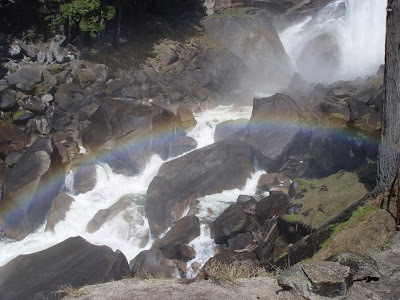 The Mist Trail is a great hike in the spring and early summer, but you are gonna get wet! I am using today's post as a bridge back to my continuing story of the real Jurassic Parks (and Cretaceous Parks) on the Colorado Plateau in the southwestern United States. 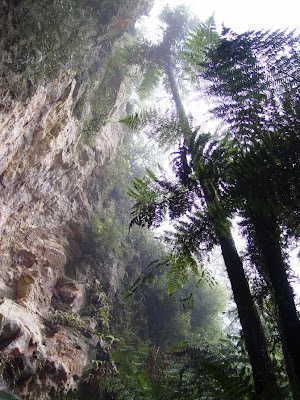 But those parks are in mostly desert environments today, and it can sometimes take a lot of imagination to see the tropical forests that existed in the region during Jurassic or Cretaceous time (of course, imagination is not a bad thing). On the other hand, there is a place in the world that has been detached from any other continent for more than 80 million years, thus preserving some elements of the Mesozoic ecosystems that existed at the time. There was a lot more to see just an achingly short time in the past, only a few hundred years ago. New Zealand consists mainly of two major islands, divided from each other across the narrow Cook Strait. The North Island includes Auckland, a city built on dozens of volcanoes, Rotorua, a geyser wonderland sitting in the midst of a huge caldera complex, and the big active volcanoes including Ruapahu, Ngauruhoe and Tongariro. The South Island includes the city of Christchurch, and a series of spectacular mountain ranges including the Southern Alps (remember the spectacular opening sequence of "The Two Towers"? ), and the Kaikoura Range that drops 9,000 feet right into the Pacific Ocean (sort of like Big Sur, but three times higher). Because the island mass separated from other continents prior to the mass extinctions of the late Cretaceous, mammals were present, but never evolved to dominate the ecosystems as they did elsewhere in the world, and eventually went extinct, except for some bat species. With the loss of the dinosaurs, the only vertebrates in position to take over the terrestrial habitat were the birds. 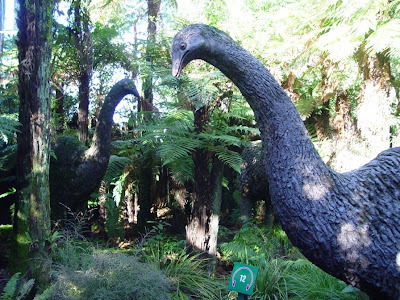 With no reptilian or mammalian predators, the birds were able to evolve a flightless existence (flight is an expensive energy proposition if it is not necessary for survival). Eventually a number of very large birds evolved, including ten species of moas. The largest stood over 9 feet tall. They were mainly plant-eaters, but an extremely large eagle lived on the island as the top predator. Unfortunately, the arrival of humans on the islands around 700 years ago spelled doom for the moas, and when they were gone the large raptors lost a main food source and went extinct as well. Only the kiwi, the small forest dwelling bird, survives today. 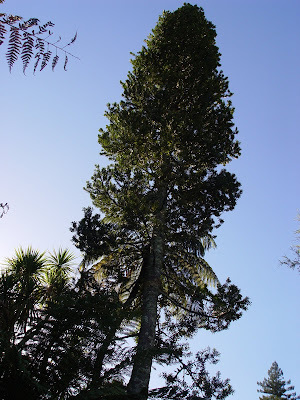 The ancient tree that captured my imagination the most was the Kauri tree (second photo), one of the bulkiest trees on the planet, rivaling even the Sequoia trees in my own backyard of the Sierra Nevada. The most mature trees are not quite 200 feet high, but their trunks remain thick practically to the crown. Their history extends back into Jurassic time. They once covered much of the islands, but unfortunately their wood is strong, mostly knot-free, and attractive. Something like 95% of the original forests have been cut down, and old-growth forests are exceedingly rare and precious. The trees are now protected by law, but ironically, dead trees in swamps are not, and the wood is durable enough that some of the trees from the swamps are still utilized legally, despite having been dead for hudreds or thousands of years. Check out a nice article in the High Country News about the latest research on earthquake risks in California, including new info on recurrence intervals along the San Andreas fault. It is a nice effort in a layperson publication to raise awareness of the dangers of living in California (a choice that has to be balanced against living in one of the prettiest and most diverse landscapes in the world). The article coincides with the Great Southern California ShakeOut scheduled for November 13, which will be the largest earthquake drill in history by most accounts. 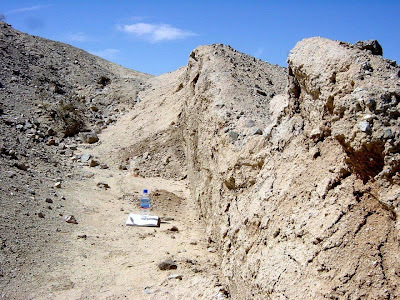 Today's photo is a scarp formed in the Mojave Desert by the 1992 Landers quake (magnitude 7.5) taken in 2003. The rip in the crust was fifty miles long, and crossed three or four previously mapped faults. Eric at Dynamic Earth added two posts, one of some Junipers, which are also high on my favorites list, for the same reasons, and the other a case of some trees squeezing the life out of some boulders. Callan Bentley at NOVAblog has some beautiful fall colors here. I haven't had the privilege of seeing fall colors in the northeast US yet, and would very much like to some day. Pools and Riffles provides some more information about species in the eastern U.S. that I am not too familiar with. UPDATE: RockGlacier at Cryology and Co adds some comments about the role of dendrochronology in geology studies. I especially appreciated the return of Ron Schott and his Gigapan camera view of a Sequoia Tree in the Lost Grove within Sequoia National Park (along with a great macrogigapan shot of the underlying granodiorite). I love the Sequoias, and have included their geological story in two of my trip guides (for Fall 2006 Tuolumne Meadows and and Fall 2005 Kings Canyon). In short, the Sequoias have existed as a genus for 200 million years or more and once existed in groves across North America, Europe and Asia. The trees of Petrified Forest National Park were probably a related species, and I have this wonderful image in my mind of giant dinosaurs wandering among the giant trees. 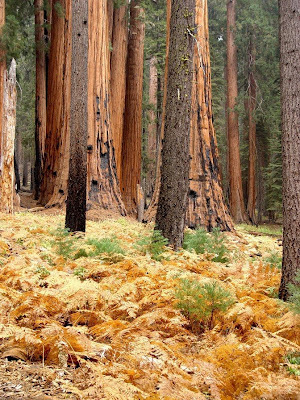 Today the genus exists only as 60 or so groves of Sequoia trees in the Sierra Nevada, as the coast redwoods in northern California, and as the Dawn Redwood in the smallest corner of China, in a single grove of no more than 5,000 trees that was only discovered in 1944, and described in 1948. It had been thought to be extinct in the Miocene epoch. 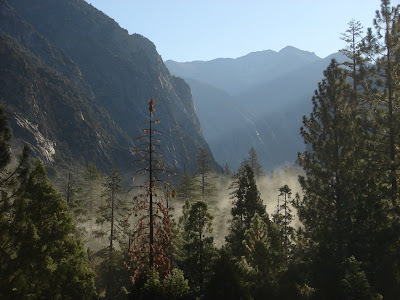 The Sequoias were apparently wiped out elsewhere by climate change, especially the Pleistocene ice ages, but in the Sierra, they survived, barely, by propogating up and down the gentle western slope of the mountains as the climate alternated between glacial and interglacial periods. Some pollen work suggests they may have been on the very verge of extinction, but luckily for us they survived, and now are appreciated as the largest living things on the planet. Nearly all of the existing groves are protected in National and State Parks, including the recently created Giant Sequoia National Monument. I have ideas for two or three more blogs on the subject of trees and geology, but I have vigorously been avoiding the pile of grading in my living room, so keep watching later this week....thanks again to everyone for your contributions! A good friend of mine, Sciguy315 responded to my mini-meme about trees that have stood out in our memories of field work and trips in geological settings. Since it was mentioned in the comments, I hope it is ok to give the picture a slightly wider audience. I especially loved his choice, as I was with him when this picture was taken. We were exploring a trail in Canyon DeChelly at the moment of moonrise, and we all were experimenting with open shutters. I was so wrapped up with photographing the ruins that I missed the tree. He produced a great many wonderful scenes of our summer adventure, which can be seen here. Some other nice photos have popped up here, here and here. Thanks for the great pictures, everyone! 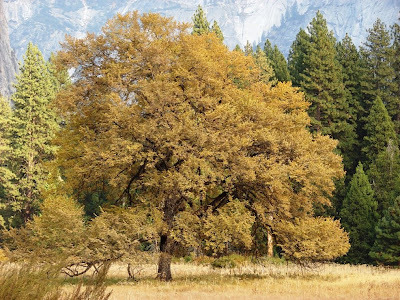 Is This the Most Beautiful Tree in the World? I know, a blog post that sounds really biological...but it has sort of a geological connection. I was in Yosemite Valley last weekend, on ANOTHER field trip (this was NOT a complaint; I had a great time introducing the valley to my Earth Science students). My problem with forests is the way the trees hide each other. Too many trees, and you can't see anything except trees, which is great, but their individuality disappears. This tree caught my attention; it has caught the attention of millions of people over the years. It stands out by itself, in a meadow that has perhaps the most spectacular setting in the world. I see it often in pictures, but I never had sat down and looked carefully at the tree itself. This weekend I took a picture of the tree just to see the tree. And then I took several dozen more! There aren't a lot of trees that come to mind that are so incredibly unique; one that comes to mind is a Jeffrey Pine that used to cling to life on the summit of Sentinel Dome. It was photographed as early as 1867, and died in the drought of 1977. It finally fell in 2003. It was shaped by windstorms and became a symbol of the struggle against the elements. Do you have a favorite tree somewhere? I'd love to see it. The beauty of this tree is relative to its location in the center of the valley. See below the tree as it appears in a photo looking southwest towards Sentinel Rock, and looking east towards Half Dome. "This is the most beautiful place on earth. There are many such places. Every man, every woman, carries in heart and mind the image of the ideal place, the right place, the one true home, known or unknown, actual or visionary. A houseboat in Kashmir, a view down Atlantic Avenue in Brooklyn, a gray gothic farmhouse two stories high at the end of a red dog road in the Allegheny Mountains, a cabin on the shore of a blue lake in spruce and fir country, a greasy alley near the Hoboken waterfront, or even, possibly, for those of a less demanding sensibility, the world to be seen from a comfortable apartment high in the tender, velvety smog of Manhattan, Chicago, Paris, Tokyo, Rio or Rome-there's no limit to the human capacity for the homing sentiment. Theologians, sky pilots, astronauts have even felt the appeal of home calling to them from up above, in the cold black outback of interstellar space. For myself, I'll take Moab, Utah. I don't mean the town itself, of course, but the country which surrounds it--the canyonlands. The slickrock desert. The red dust and the burnt cliffs and the lonely sky--all that which lies beyond the end of the roads." These are the opening words of one of the most influential books in my life: Desert Solitaire by Edward Abbey. I first read it in the last years of my adolescence, just when I was searching for a direction in my life. 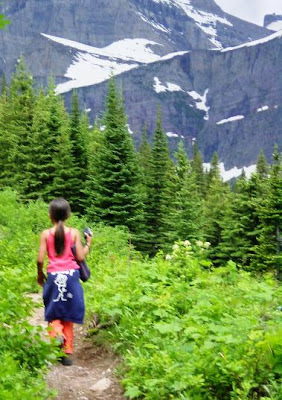 What could I do for a career that would combine a love of wilderness, the chance to spend time in the outdoors, and teaching about the wild places to those who haven't been there yet? After reading his book, I wanted to be a park ranger in the worst way, although that desire was later tempered by the realization that I would have to be more of a policeman of the wilds, dealing with a recalcitrant bureaucracy, and dealing with all manner of moronic tourists (ok, not all of them...but still...). His book, published in 1968, was a description of a summer spent as a ranger in what was then Arches National Monument. The monument was, at the time, one of the most remote corners of North America, barely accessible by rough dirt tracks, generally unvisited, and one of the most beautiful places in the country. It was a call for protection of the beautiful places, and a warning about the future direction of wilderness management in the Colorado Plateau region. The book ended up a paradox: it publicized a region of spectacular scenery, which in turn led to a vast increase in visitation which in turn required developments and "improvements" to accommodate the visitors, which in turn threatened to destroy the very wildness that made the region so attractive to start with. Abbey was worried about "industrial tourism", and yet was largely responsible for the fact that it happened in this place that he called the most beautiful on earth. Well, I never became a ranger, but I was lucky enough to find a career that allowed me to achieve my other goals. As a geology instructor, I have been leading trips into the Plateau region for twenty years, and in a sense, I have become one of the industrial tourists, but usually in the name of education. I want my students to come away with an appreciation of not just the scenery but of the vast history represented by the rocks. Arches National Park is one of the ultimate expressions of scenery produced by the Entrada Sandstone. More on the park in the next post. 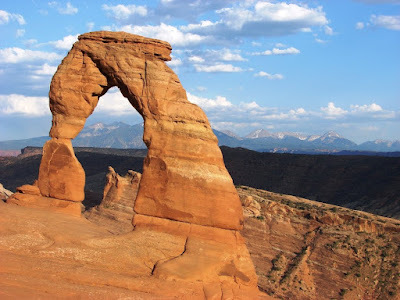 For today I provide a picture of one of the more famous sights in the park, Delicate Arch, with the laccolithic La Sal Mountains in the distance. It lies at the end of a stunning 1 1/2 mile hike across the slickrock that ranks with Angels Landing as one of my favorite strolls in North America. No Child Left Inside: Earth Science Week! I want to encourage all of you to make the outdoors accessible to a child this year, in honor of Earth Science Week, October 12-18 (official site here)! What a great theme! It is true in my neck of the woods, and probably most other places that field trips for elementary school kids are becoming rarer and rarer as budgets tighten. We are spending more and more time teaching our children how to take a d*mned multiple-choice test in math and English, while forgetting that most real learning takes place in the sciences and arts. I guess we are trying to produce a bunch of factory automatons who will punch buttons well, and will never complain, never wish to travel, and never appreciate the wonderful world that lies beyond the edge of their city or town. I see it already in my college classes: students who, in our case, live just a two hour drive from Yosemite National Park, but have never once been there. Many of the students in our area used to pay a visit to a local cavern (Moaning Caverns) in the 5th grade or so, but lately I am finding that fewer than ever have done so. I get blank looks when I mention it. It's a terrible loss, and a lost opportunity. Those of us in the teaching community need to do what we can. If they can't take the child outside, we can bring the outdoors a little closer to them. Make yourself available to visit elementary classrooms; brings some rocks (especially volcanic ones), and bring some fossils (they go nuts over dinosaurs but are impressed by the smallest shells). Bring a projector and some digital images; they will follow with rapt attention your description of earthquakes, volcanic eruptions, dinosaur digs, literally anything you want to talk about. They are hungry to hear from someone who has been out there doing these exciting things. Kids today have a lot of distractions, in busy family lives, soccer practice, television, cell phones, the internet, and it can be hard to break through. But you can, believe me! In some parts of Utah, there are places where Cretaceous oyster fossils so common they are dug up and used for roadbeds. Take those same nearly useless shells, and give one to each kid in a classroom, and you will make an impression that will be remembered for years. Let a kid touch a real dinosaur bone, and they will not forget it. You may never know what effect you have had, but sometimes you get a surprise. 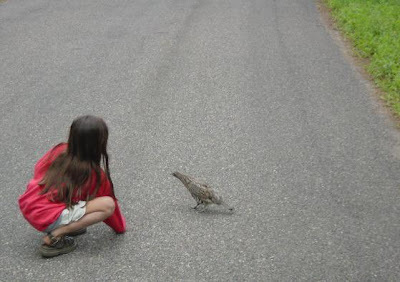 About fifteen years ago, a parent brought her child on a field trip with me. I thought little of it at the time, but that young lady is finishing a master's degree in volcanology in Idaho these days. I didn't remember that she was on that trip so long ago, but she dropped off a picture of her as a ten-year-old standing next to a (much thinner) me that sits enshrined on my wall. Take a chance. When there is an opportunity to do it, bring some kids on a field trip. Visit their classrooms, share some of your stories. It will have a huge effect. The young lady in the bottom photo was finding out how stubborn an animal can be when protecting her young...the grouse actually stood down a line of vans in Grand Tetons, refusing to let us pass by, and not running away as we tried to shoo it off the road. Think she will ever forget the moment? Back on the (virtual) road with our exploration of the geology of the Colorado Plateau, and the current series on the REAL Jurassic Parks. In our last post we were chasing "Galaxy Quest" rock monsters through Goblin Valley. Today, we are seeing another of the little-known gems of the Plateau country, Kodachrome Basin State Park in southern Utah. Kodachrome is another park that puts the Entrada Sandstone on prominent display along with something like four dozen unusual formations called clastic pipes. These enigmatic features jut through the Entrada Sandstone, and being better cemented than the surrounding rock, they tend to stand out as towers tens of feet high (the highest are more than 100 feet). They are mostly composed of breccia and sandstone. Their origin is unclear, although there are plenty of well-considered hypotheses including cold and hot springs, earthquakes, overburden pressure, and UFO's (they always have something to do with weird things out here). I have no particular expertise to judge, but I have to note the presence of several major fault zones in the immediate vicinity, and can easily imagine an origin rooted in liquefaction effects (this statement acknowledges the fact that we can see the things we know about and can miss evidence favoring things we know nothing about...). Some of the pipes are exposed in their original matrix of Entrada, as can be seen in the second photograph. Notice how the strata form a graben or syncline in the area adjacent to the pipe. Why the unusual name? Aren't there trademark restrictions or something on such blatant commercialism? Actually, the name was given to the basin in 1949 by the National Geographic Society following an expedition in the region. Yes, an expedition. Even today, the area remains one of the most isolated corners of the lower 48 states. They were using the newfangled color film, and were inspired by the intense coloration of the rock (for those of us too young to remember, there was a time before digital cameras....). The basin became a state park in 1962, and was called Chimney Rocks for fear of trademark infringement or something, but Kodak recognized good PR, and happily let the state keep the name. They have even sponsored park brochures (in color, of course). If you are leading a field trip through the region, and find nearby Bryce Canyon too crowded and noisy, consider Kodachrome as an overnight stop. There are two nice group campsites, and a good shower facility (we of the long trip persuasion have to remember the basics....). A network of short trails explores the park, and a short drive east reveals the spectacular Grosvenor Arch. A longer gravel road (Cottonwood Canyon Road) travels south along the Cockscomb Monocline, emerging near Page and Glen Canyon Dam. It's a great drive...in dry weather. Don't try it after storms! The Utah State Parks website for Kodachrome can be found at http://stateparks.utah.gov/parks/kodachrome/. BTW, geology road guides for all state and national parks in Utah can be accessed at http://www.utahgeology.org/uga29Titles.htm. These are PDF's of the first edition of the truly excellent book Geologic Road, Trail, and Lake guides to Utah’s Parks and Monuments, P.B. Anderson and D.A. Sprinkel, editors (Utah Geological Association-29 Second Edition, , 2004, CD-ROM, $14.99. Available at the DNR Map and Bookstore, http://mapstore.utah.gov/ ). The roadguides are a companion to the very comprehensive Geology of Utah's Parks and Monuments, also available from the Utah Geological Association. From local television station KCRA , a Yosemite thread (pictures, scoll down), and Geology.com , some info on a pair of rock falls in Yosemite Valley that damaged some cabins and injured several people. Needless to say, a place with vertical walls of jointed granite thousands of feet high is going to have rock falls on occasion, actually lots of occasions. We had the first major storm of the year last weekend with snow and freezing temperatures in the high country, so this activity was no surprise. I don’t think it's much of a stretch to say at this point that the campaign of John McCain---once touted as being oh-so-honorable by the Very Serious People who enjoyed his barbeque wings and fluffy cushions on the "Straight Talk Express"---is now one of terror. When shouts of "treason!" and "kill him!" and "terrorist!" and "N*gger---sit down, boy!" are allowed to go unchallenged right in front of the Republican candidates' noses---just feet away from their lecterns---it's pretty clear that the thugs are in charge. What's worse, there's absolutely no way McCain can stop it, now that he's given them tacit permission to go postal. All of his ethics scandals and health issues don’t mean a hill of maverick turds anymore compared to what he has just implicitly green-lighted: namely, pitting American citizen against American citizen through race-baiting and threats of physical harm. His children must be so proud---especially the black one. John McCain was once the recipient of this kind of race-baiting; George Bush did it to him in 2000 in South Carolina, and McCain lost as a result. Now, in 2008 he has hired the consultants that organized that campaign for Bush. It is worse than shameful. I pray that my country is better than this. We've got challenges the likes of which we've never faced before, in energy, in global climate, in housing, in the economic meltdown, and we should choose our candidates on the basis of their ideas, not because they can better assassinate the character of their opponents. Out on another field trip this weekend; I took 12 students on a whirlwind tour of Sequoia and Kings Canyon National Parks on the western slope of California's Sierra Nevada. 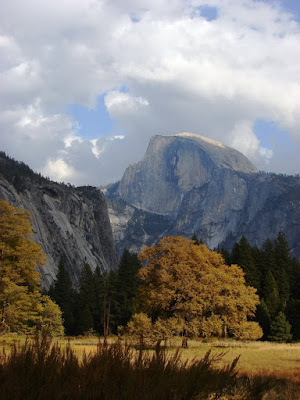 The parks are known well enough, but receive only a fraction of the visitation of Yosemite. 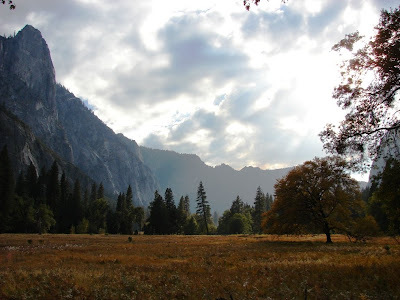 I'm fine with that, actually; imagine having a valley that is as spectacular as Yosemite practically to yourself. 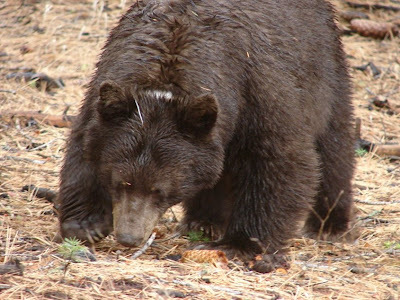 That can happen this time of year at Cedar Grove on the South Fork of the Kings River. Ask people what the deepest canyon in North America is, and you will likely get "Grand Canyon" as an answer. They would be wrong by nearly half a mile: a stretch of the Hells Canyon, Oregon/Idaho, and Kings Canyon both reach depths of more than 8,000 feet (Grand Canyon is about 5,500 feet deep, and Yosemite Valley is 'only' 3,000 feet). 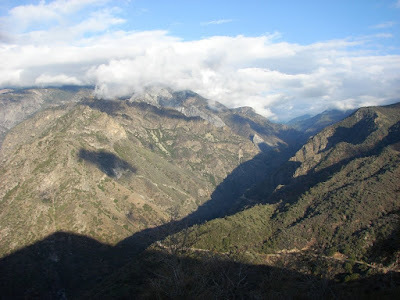 A spectacular highway winds down the steep canyon walls into Kings Canyon National Park at Cedar Grove. Junction View provides an outstanding view of the canyon in the deepest section. It is entirely formed by river erosion; the glaciers never reached the area shown in the first picture above. 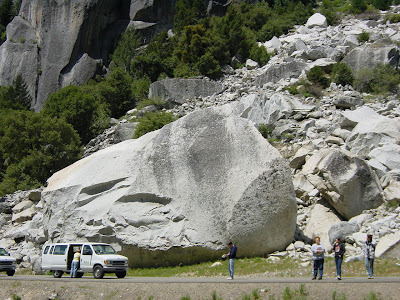 Ask people what kind of rock makes up the Sierra Nevada and you will probably get a blank look, but some will mention "granite". It is true that most of the Sierra (three quarters or so) is made up of granitic rock (defined as plutonic rock with quartz and feldspar), but only about 10% is actually granite as defined by petrologists. Most of the plutons are composed of granodiorite and tonalite, which contain greater proportions of plagioclase than orthoclase. In addition, something like a quarter of the range is made of metamorphic rocks. Metamorphic rocks are visible in the upper parts of the first photograph. The exposures include quartzite, slate, schist and marble of the Boyden Cave Roof Pendant. Cedar Grove is higher in the mountains, and the valley floor has been shaped by the glaciers that scoured the highest parts of the range (see the second picture). With the high cliffs and meadows, the valley is reminescent of Yosemite, though it lacks the dramatic waterfalls (Roaring River Falls are certainly memorable even though they don't have the height of Yosemite Falls). Trails lead to some of the most attractive alpine scenery in the world at places like Rae Lakes and Evolution Basin. Moro Rock and Hanging Rock: Exfoliation and jointing, and a simply spectacular view of the alpine scenery of the Great Western Divide (12,000 feet and more). 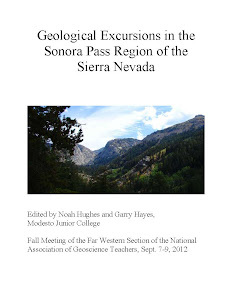 The best, most accessible resource on the geology of the parks is Exploring the Highest Sierra by J.G. Moore. It includes detailed geology road guides and trail guides. Welcome to one of the most unusual (and most isolated) parks in the American Southwest, Goblin Valley State Park. It is located in south-central Utah, miles from anywhere (the relative metropolis of Green River, population 973, is about 50 miles away). It is a fine introduction to the Entrada Sandstone and Summerville Formation, two of the more scenic layers within the San Rafael Group. 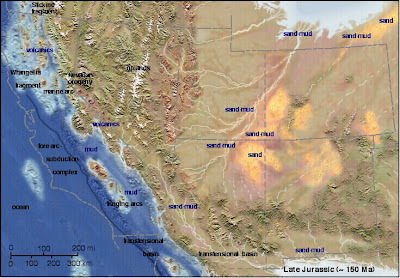 In the latest part of the middle Jurassic (around 165 million years ago) huge changes were taking place across the American west. A subduction zone had formed off the coast of California, and compressional forces had caused the faulting and uplift of a range of mountains across Nevada. A shallow sea occasionally extended into the region from the north, leaving vast deposits of mud, silt and sand deposited in tidal flats, while in other areas river floodplains and desert dunes predominated (the region still lay across the subtropical belt, much like the Sahara today). 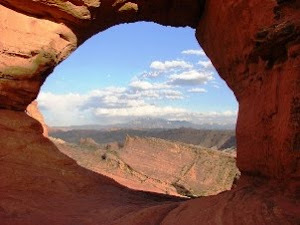 The sediments, which have a distinctive red-brown color, are known today as the Entrada Sandstone. In other regions, the Entrada is primarily a cross-bedded sandstone that forms distinctive cliffs, but here at Goblin Valley, the formation is more variable, with alternating layers of sand, silt and shale that erode in a differential manner, forming slopes and ledges. The Goblins are short spires called hoodoos, which resulted from the erosion along joints and fractures in the rocks. If you are a fan of the movie "Galaxy Quest", will immediately recognize the park, and will probably be looking for cute little purple cannabilistic space aliens and immense rock monsters. You will probably be disappointed in your search, but your imagination will probably conjure up even more fantastic creatures as you wander through the goblins. The park includes a unique campground that is nicely developed with showers and flush toilets but very little shade (there is a nice group campsite too). During the summer we make a point of arriving in the late afternoon when the sun is approaching the western horizon. The views east are expansive, and few parks in the American west offer better star-gazing. The San Rafael Swell, a huge monocline, lies just to the west. The Henry Mountains, one of the last mountain ranges in the United States to be given a name, lie just to the south. Reaching over 11,000 feet, they are a series of laccoliths, a unique type of mushroom-shaped intrusion, almost, but not quite volcanoes (although volcanoes may have once existed above them). The region is also a great place for seeing pronghorn antelope!